Figure 1: Schematic view of the PANDA detector (top left) and sketch of the target spectrometer (top right). Bottom: General layout of the MVD detector (left) and implemented CAD model (right). A vertex resolution better than 100 micrometer is envisaged which allows e.g. 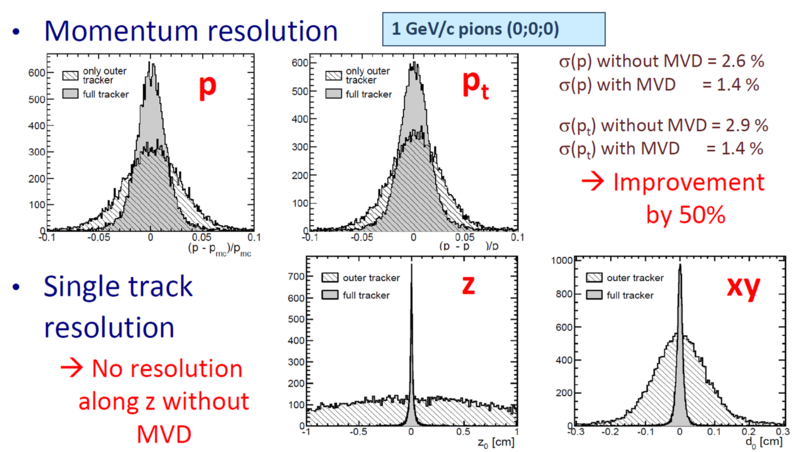 a tagging of D-mesons (containing a c-quark) with decay lengths of several hundreds of micrometers. More details of the PANDA physics program and the performance of the detector can be found in the PANDA Physics Performance Report with a dedicated sub-chapter for the D-meson reconstruction at page 77-82. Further studies concerning the MVD are summarized in the PhD thesis of René Jäkel. The close position to the primary interaction zone demands radiation hard detectors and frontend electronics. For the full run time (10 years with duty cycle of 0.5) a radiation tolerance of around 1014 neqcm-2 is required. 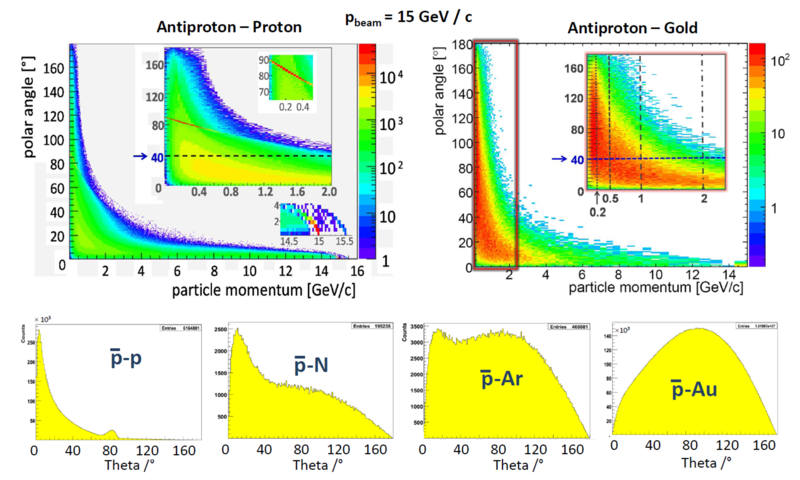 Figure 2: Expected particle distribution for different targets at highest beam momentum (15 GeV/c ). Top: Entangled distribution with respect to polar angle and particle momentum. Bottom: Overall angular distribution for the polar angle Theta. The PANDA experiment will be performed with high-quality anti-proton beams over a broad momenta range from 1.5 GeV/c to 15 GeV/c . 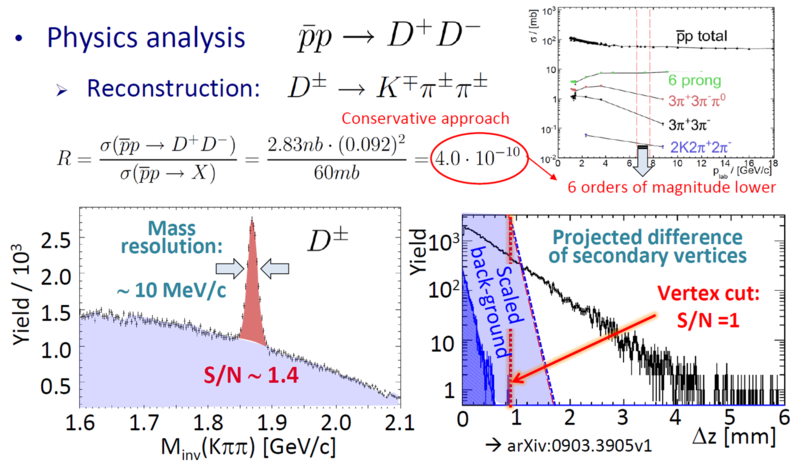 The envisaged peak luminosity is aimed to be 2×1032 cm -2 s-1 for 1011 stored anti-protons leading to an averaged nominal interaction rate of 2×107 /s. More details can be found e.g. in the Magnets Technical Design Report. The beam-target interaction will be quasi continuous and inhibits a complex, non-ordered time structure. The maximum interaction rate on a short time scale will exceed the mean value significantly, in particular in case of using a pellet target. Due to the fixed-target set-up an enhanced emission of highly energetic particles in forward directions is prominent in particular for light targets. Moreover, particles with momenta below 1 GeV/c originating from particle decays are uniformly distributed to nearly all polar angles (see figure 2). For the pixel part of the MVD four sensors of different lengths are used. The design is based on a pixel cell size of 100×100 µm2. Three different sensor types are implemented within the strip part, having either a rectangular shape for the barrel part or a trapezoidal one for the disk part. The rectangular sensors feature a stereo angle of 90°. In case of a trapezoidal shape a stereo angle of 15° is chosen. 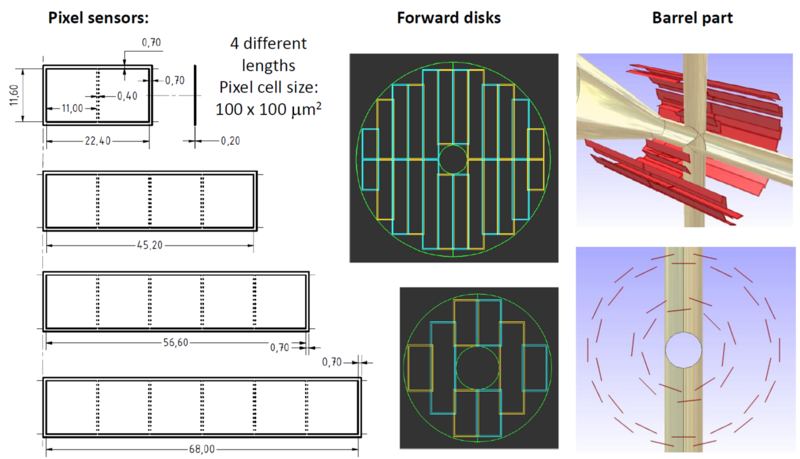 Guided by small angle scattering in the previous detector layers, a readout pitch of 130 µm was chosen for the rectangular sensors, while a smaller pitch of 70 µm is used in the trapezoidal sensor due to the smaller stereo angle which tends to worsen the spatial resolution. The use of double-sided silicon strip detectors in the outer detector layers reduces the number of readout channels significantly. Finally, there are roughly 12 million pixel and 200,000 strip readout channels. 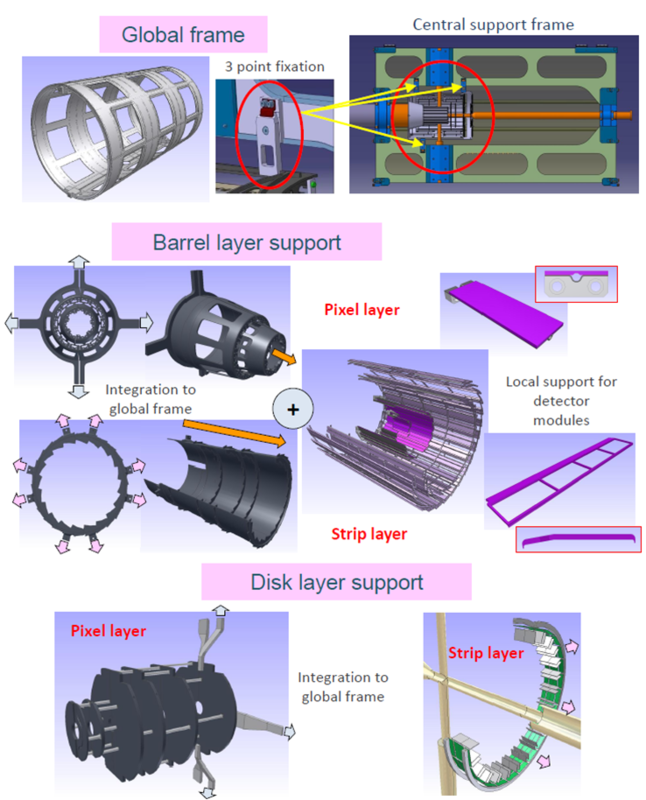 All MVD components are integrated within a global frame which has a three-point fixation to the global support structure of the central tracker. 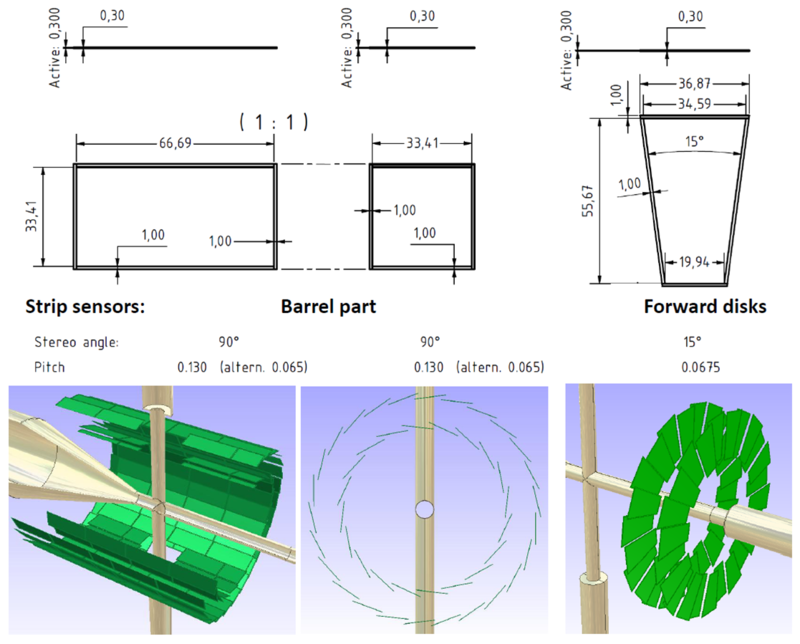 The detector modules of the barrel part are supported by individual staves which are then attached to an additional support structure for the pixel and the strip barrel layers. The pixel detector module for the forward pixel layers are glued to support half-disks. Spacers connect the different disk layers. For the strip disks a two subsequent sensors are forming a compact mechanical super-module which can be plugged to a support ring. More details are illustrated in figure 5. In figure 6 a schematics of the overall routing concept for the MVD is shown. It is evident that all routing paths must be carried out in upstream direction. The current hardware development contains a variety of different projects which are summarized shortly below. More details can be found in the given references. To check the physics performance of the detector and to optimize the engineering implementation a dedicated software is available. One part allows the conversion of CAD models into root geometries, thus allowing to implement detailed models into physics simulation. As a result, e.g. the coverage of the detector can be optimized aiming on a minimum of four hit-points inside the MVD ( figure 7, left). Moreover, a mapping of the material budget is possible ( figure 7, right). 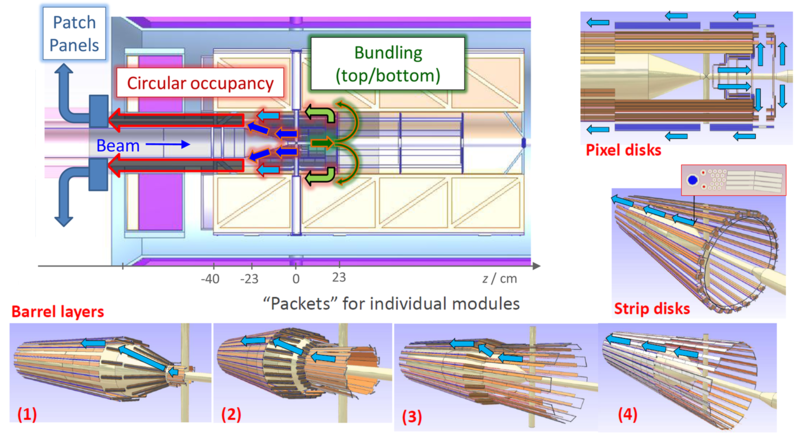 Moreover, more dedicated simulations have been performed including a full analysis of a physics benchmark channel. Some of the results are listed in the figures below. T. Stockmanns: The micro-vertex-detector of the PANDA experiment at FAIR. T. Stockmanns: The micro-vertex-detector of the PANDA experiment at Darmstadt. F. Hügging: Development of a Micro Vertex Detector for the PANDA-Experiment at the FAIR Facility. Thinned epitaxial silicon hybrid pixel sensors for the PANDA experiment. TOPIX: the first prototype of pixel readout for PANDA experiment. Radiation damage test for TOPIX. Th. Würschig: Utilization of Double-Sided Silicon Strip Detectors within the PANDA Micro-Vertex-Detector. Radiation Damage Effects on Epitaxial Silicon Devices for the PANDA Hybrid Pixel Detector. A Silicon Pixel Readout ASIC in CMOS 0.13 um for the PANDA Micro Vertex Detector. M. C. Mertens, F. Hügging, J. Ritman, T. Stockmanns: A Versatile Digital Readout System for the PANDA MVD. Single Event Upset Evaluation for the Readout ASIC of PANDA Micro Vertex Detector. The silicon pixel system for the Micro Vertex Detector of the PANDA experiment. Front End Electronics for Pixel Detector of the PANDA MVD. Charmed meson reconstruction with the PANDA detector. Hybrid pixel detector with epitaxial sensors and readout in 130 nm CMOS technology for PANDA. Hybrid pixel detector in the PANDA experiment. Mechanics and detector integration in the PANDA Micro-Vertex-Detector. The silicon pixel readout architecture for the Micro Vertex Detector of the PANDA experiment. Contribution of the MVD to the charm spectroscopy at PANDA. Characterization of the PANDA Micro-Vertex- Detector and Analysis of the First Data Measured with a Tracking Station. D. Calvo, P. De Remigis, G. Giraudo, G. Mazza et al. FPGA-based readout for double-sided silicon strip detectors. Readout System for PANDA Silicon Strip Prototype Studies. Triggerless and low mass Micro Vertex Detector for the PANDA experiment. Thermal performance of carbon foams used as heat sink for the pixel MVD PANDA. Low mass aluminium microstrips for data transmission in the Micro Vertex Detector of the Panda experiment. Irradiation tests for the PANDA MVD. Measurements with a Si-strip telescope. Hybrid Pixels for the Micro-Vertex Detector of the PANDA Experiment. Beam tests and performance studies for the PANDA Micro-Vertex-Detector. Development of Silicon Strip Sensors and radiation hardness studies for the PANDA MVD. All published detector notes have been reviewed within the MVD subgroup. 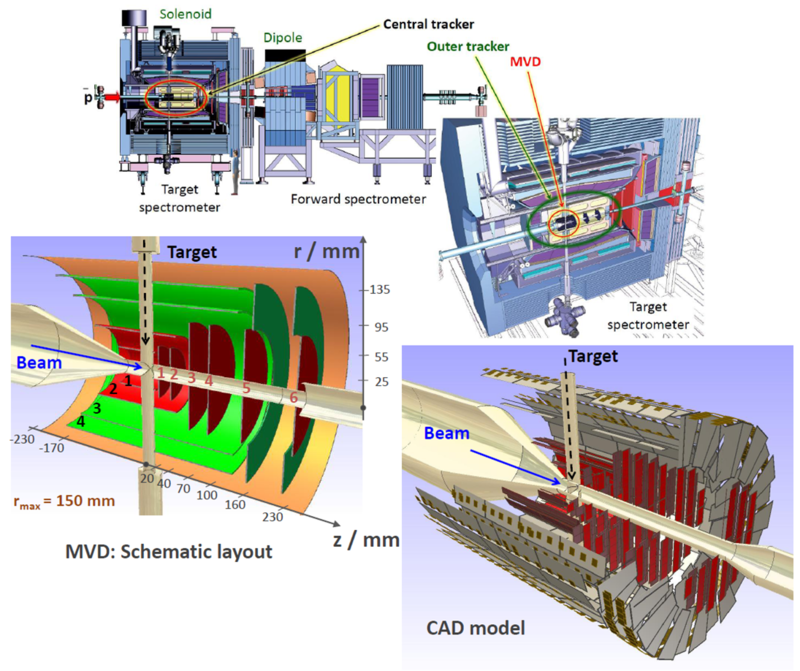 The work on the MVD was partly supported by the EU, FP6 "Dirac secondary beams"